Based on the book Cameron Townsend: Good News in Every Language. 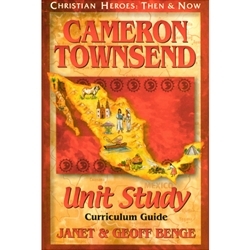 Each Christian Heroes unit study curriculum guide corresponds with the book from the Christian Heroes: Then & Now series. These guides provide the Christian school teacher and homeschooling parent with ways to use the book as a vehicle for teaching and reinforcing many curriculum areas including geography, social studies, history, and world missions.